In May 1884 the Revd. George Edmund Tatham who had done so much for St Andrew's over the previous 25 years decided it was time to move on. He actually swapped the Ryburgh living with the then incumbent of East Molesey,the Revd. Morris Joseph Fuller who had been the Vicar there since 1897. We first meet him in the pages of the Ipswich Journal on the joyful occasion of his daughter, Emily's wedding at Ryburgh and with hindsight would ask, what was wrong with Ryburgh Station? Whilst at Ryburgh he would seem to have spent much of his time in writing and publishing sermons, tracts, pamphlets and books and it is suprising therefore that he used the public medium of print to such disadvantage in the following episode for one sufficiently experienced to have known better...... but then again men didn't do the laundry at all in those days!. THE NORFOLK AND NORWICH PRESS. Who steals my purse steals trash, ‘tis something, nothing. For several years children belonging to the Shoreditch Union have been boarded out with two respectable families at Ryburgh. The children were well cared for, and no complaints whatever were made by the Boarding Committee as to their education or surroundings until last month, when Mrs. Fuller, wife of the Rector, and President of the Committee, wrote to the Shoreditch Board of Guardians, asking that they should be removed,“owing to the immorality prevalent in the village.” Upon this letter being received one of the Guardians observed that it was evident that a mistake had been made in the selection of Ryburgh, and it was decided to remove the children immediately. The matter might have ended here, but Mrs. Fuller’s letter with the resolution of the Guardians appeared in “Lloyd’s Weekly Newspaper” on the 18th March, (1888) and the inhabitants were much incensed at seeing their parish so ruthlessly slandered. That this resolution should have as much publicity given to it as the original charge, must be the desire of every well-wisher of the village, and it is in the hope that it will be the means of refuting so serious an imputation on the morality of Ryburgh that this pamphlet is published by an inhabitant. Scandal flies on eagle wings, and rumour with her thousand tongues has been busy with the tale of Ryburgh’s immorality during the past month. The news travelled with increase from mouth to mouth. And interrupts the story of my tongue. “LLOYD’S WEEKLY NEWSPAPER,” MARCH 18 TH, 1888. THE CARE OF PAUPER GIRLS. At the Shoreditch Board of Guardians, on Wednesday, a letter was read by the clerk from Mrs. Fuller of Ryburgh, the President of the Ryburgh Boarding-out Committee, proposing to transfer two girls placed in that village by the Shoreditch Board of Guardians to the Servants’ Training Home at Fakenham. She stated that whether the girls were sent to that institution or not, it was imperatively needful that they should be removed from Ryburgh, on account of the immorality prevalent in that village. Mr. Alabaster said it was clear that a mistake had been made in the selection of Ryburgh, and moved that the children be brought away forthwith and placed in the institution belonging to the Board of Guardians at Shoreditch. The motion was agreed to. “Eastern Daily Press “ March 21st, 1888. IS GREAT RYBURGH AN IMMORAL PLACE?- At the Shoreditch Board of Guardians on Wednesday a letter was read by the clerk from Mrs. Fuller, the rectory, Ryburgh, the President of the Ryburgh Boarding –out Committee, proposing to transfer two girls placed in that village by the Shoreditch Board of Guardians to the Servants’ Training Home at Fakenham. She stated that whether the girls were dent to that institution or not, it was imperatively needful that they should be removed from Ryburgh on account of the immorality prevalent in that village. Mr. Alabaster said it was clear that a mistake had been made in the selection of Ryburgh, and moved that the children be brought away forthwith and placed in the institution belonging to the Board of Guardians at Shoreditch. The motion was agreed to. The above has caused great indignation amongst the inhabitants, and it is felt on all sides that the report is entirely without substantial foundation. 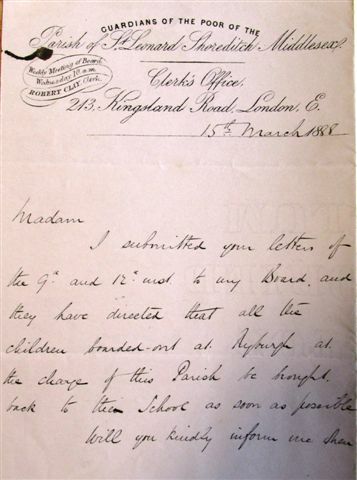 Mr. Cooper, overseer, has written to the Shoreditch Board of Guardians stating that he will bear any expense to the amount of £5 if the Guardians will send an Inspector down to view the homes the children are in and to hold an inquiry as to the manner in which they have been treated. The following notice has been signed by Mr. Cooper, and posted in the parish:- “At the conclusion of the ordinary business at the parish meeting, to be held on Thursday evening next, in the School-room, I shall call attention to Mrs. Fuller’s report on the state of the parish to the Shoreditch Board of Guardians, and move a resolution condemning such report as a gross misrepresentation of facts. Expression of opinion will also be asked as to what further steps should be taken to clear the parish of the unworthy and damaging statements the report contains, I ask the support of the parish in this matter.” A largely attended meeting is anticipated on Thursday and a full report of the proceedings will be published accordingly. Daily Press March 23rd, 1888. IS RYBURGH AN IMMORAL VILLAGE? A most enthusiastic meeting was held in the schoolroom on Thursday evening, which was attended by the Churchwardens, Overseers, Guardians, and the greater portion of the adult population of the parish, and the proceedings throughout were very orderly. Ryburgh Rectory , March 21st 1888. P.S.- Unless I hear that you object I shall read your letter to the meeting. Mr. Herbert Smith (parish churchwarden) seconded the motion. Dear Mr. Bradley,- As I presume you will be present at the meting tonight, I feel obliged if you will kindly read the letter I address to you. 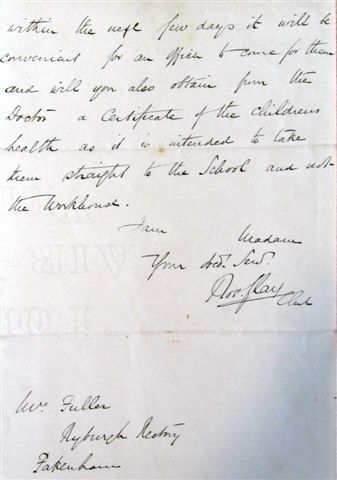 I was very sorry to see that a remark I had made in a privileged communication to the Clerk of the Shoreditch Guardians for the benefit of the orphan children committed to my care had been quoted in a public paper. Had I any idea this could have been done, I should not have written as I did; for I had no wish whatever to injure the parish, or expose its faults to the public. But as Mr Cooper in a placard has accused me of “ gross misrepresentation” I feel it due to myself to state some FACTS which led to the opinion respecting the parish to which I had arrived. I conclude I am addressing the most moral and respectable of our people, or they would hardly presume to be present at an indignation meeting of this kind, and as such shall have their sympathy in what I am about to say. 1 We are a parish of 900 people, How very few honour the Sabbath, or attend any place of worship on the Lord’s Day? Is this morality? 2. It is reported that one of the magistrates of the Fakenham Bench has stated that Ryburgh was one of the worst parishes brought before their notice for poaching and other misdemeanours. Is that morality? 3. Look at the overcrowding of our cottages. I know one house where eleven of both sexes occupy two bedrooms, and another where seven occupy one, and many others where only a curtain divides men from women. Is this morality? 4. With regard to breaches of the 7th commandment (the one about adultery). You have only to refer to our baptismal register or make a house to house visitation of the parish to see how little that is regarded. For all these reasons I thought it desirable that the orphan children under my care, and who have arrived at the age of 14, (the age they should have to leave school) should be removed from this parish. Owing to their antecedents, they are more susceptible to bad influences than others, and therefore require more anxious care. Mr D. Mesney then said- I as Guardian of the parish would like to know Mrs. Fuller’s author as to the alleged immorality. She has been absent four months, and I living in the parish for many years, and knowing the parish well, know of nothing whatever in the parish that has been immoral, and I contend that our parish will compare favourably with any other in the neighbourhood, and I consider the letter which was written to the Guardians a great error, as wherever we go now we are checked about coming from an immoral place. The Rev-Paston of Wells, said – I am not a parishioner, but I must beg the favour to be allowed to say a few words. On Monday last I was visiting some of my congregation when they showed me a paper with a report of Mrs. Fuller’s letter to the Shoreditch Board of Guardians; and I could not believe it was the Ryburgh near Fakenham, as I have visited many of the cottages and can safely say that I find the people respectable, civil, and their morals for the poorer classes quite as good as their richer brethren. As to Ryburgh being the worst place as regards crime, if one will only read the reports of the sessions &c. they will see that there is seldom a case from this parish, and that when Mrs. Fuller wrote to the Shoreditch Guardians she could not have thought seriously of what she was writing, or the trouble it might cause. Mr. S. Utting then briefly addressed the meeting. He said he was sure the morality of the parish would compare favourably with many parishes around. After some further observations, the resolution was put to the meeting and carried unanimously. Mr Mesney moved and Mr Green seconded, that Mrs. Fuller be asked to publicly state who her informant is as to the immoral acts, so that the parties thus accused may defend themselves, and unless she gave her informant, she should publicly apologise to the parish through the press. This was carried with great applause. Mr. Cooper[said]- Mr. Clay the Clerk to the Guardians is coming down to inquire into the matter, and I shall strongly object to any inquiry being made to which all the parishioners are not invited, so that all can be made public, and all who are charged could come and refute the statements made, and I shall take particular notice that due notice be given of such enquiry. Mr. Paston then proposed a vote of thanks to the Chairman which was unanimously carried amid loud applause. What a row at Ryburgh! The wife of a clergyman has written an injudicious letter about the morals of the parish and, contrary to her expectations, it got into print. Naturally, the people do not like to have their ways and manners questioned, and denounce the letter as a libel. The probability is that Ryburgh is no better and no worse than other villages of 900 inhabitants. Among so many there is sure to be some black sheep, but that is no reason fixing the mark of disgrace on the whole flock. One point must be mentioned in the lady’s favour. She did not publish the letter. It was intended as a private communication. What blame can be assessed for writing it lies at her door; but the blame of publication lies elsewhere. If the parish is so bad, I advise the rector and his wife to keep quiet over it and set themselves earnestly to remedy it. SIR- I had no intention of replying to the indignant strictures of Mr. Thomas Cooper, who to the astonishment and amused bewilderment of the parishioners (for he is a recent importation from the shires, comparatively speaking) has suddenly emerged from his obscurity and assumed the role of “patriot, purist and moralist.” If the report of your paper be a correct one, he has taken the opportunity of his outrageous and unmanly attack on a lady at the annual vestry meeting convened for the purpose of electing parish officers (overseers, waywarden, parish constable and guardian) to make a side-thrust at me in my official capacity as rector by accusing me of absence from my parish and neglect of visiting my people. In self-defence, please allow me to say that I was only absent two months at Christmas, preferring to take my annual holiday in the winter, rather than in the summer, and I returned in time for my Lenten duties; and as to enjoying myself, I took duty the whole time in a Brighton parish to see some town work. During my absence I left an efficient “locum tenens” resident in the rectory. With regard to visiting, I have had a most excellent staff of visitors, besides my own personal contribution to it, and such a system has been adopted that every house was carefully visited weekly, and the visitors’ reports and statistics were tabulated at the monthly meeting at the rectory, so the wants of the parish have been fully attended to. But what can Mr. Thomas Cooper of the Farmers’ Foundry be supposed to know of our parochial organization? As to the immaculate gentleman himself, who has struck the indignant attitude and thrust himself forward as the champion of the morals of the Ryburgh, although I have been in the parish nearly four years (and I have fifteen services every week in my parish church) I don’t think I have ever seen him at church more than twice all this time. Nor indeed, if report be , does he ever attend any place of worship. In the conversation which Mr. Cooper alluded to he averred that the morality of the place used to be very low, and he gave me a description of the village street at night in former days in language which I cannot repeat here; but he went on to say that there had been a marked improvement during the last two years, which may lead one to the hope that one’s ministrations have not been all in vain. At all events, after the trouble and care which Mrs. Fuller has taken in these orphans for the last four years- a responsibility which was none of her own seeking, and of which Mr. Cooper is not in a position to know anything- it does seem a poor return as well as a mean and cowardly act, when it has come to a natural termination to offer a lady such a wanton and outrageous insult as this person has thought fit thus publicly to make. Ryburgh Rectory, March 24th 1888. GUARDIANS OF THE POOR OF THE PARISH OF ST. LEONARD, SHOREDITCH, MIDDLESEX. Clerk’s Office, 213 Kingsland Road London, E.
Mrs. Fuller. R. Clay, Clerk to the Board. SIR- The Rev. M. Fuller’s remarks concerning myself, in his letter which appears in your issue of this morning, bear traces of such kindly(?) feeling that I will not mar their effect by further notice, and if he had been content with personally abusing m I should not have troubled you with any reply. But he makes sundry assertions which appear so greatly at variance with facts that I cannot allow them to pass unnoticed. I will not encroach upon your valuable space by mentioning all the points, but will just give one example. In his letter he asserts that “he returned in time for his Lenten duties.” Now, I most emphatically declare that he was not here to conduct service on Ash Wednesday, nor did he provide a substitute. Several people went to the Church, and there was no service on that day. If Ash Wednesday is not in Lent, I have no more to say on the subject. But if it is in Lent, then no amount of explanation will prevent the public estimating the value of rev. gentleman’s assertions in the rather strong light of this example. SIR- As churchwarden of the parish of Great Ryburgh, I beg to state the reason there was no service on Ash Wednesday was our locum tenens was requested to stay over that day, but he was obliged to leave suddenly the day before, to go into Devonshire to his new living to be instituted. I tried to get a substitute, but was unsuccessful. I am not aware that anyone went to the church or was disappointed. In fact the weather was so bad that it was not fit to attempt it. Our rector returned on Friday, and took up his service the first Sunday in Lent. JOHN BLOMFIELD, Chuchwarden Manor House, Great Ryburgh, March 27th 1888. P.S.-I feel I ought to add my entire satisfaction, as churchwarden, as to the efficient manner and frequency with which our church services are rendered. SIR- Having endeavoured to whitewash the morals of the Ryburghs by a public resolution, in vestry assembled, our parish mentor, Mr. Thomas Cooper, with his usual effrontery and customary success, has again stepped out of the ranks to complain of the clerical irregularities of his rector by alleging that we had no service on Ash Wednesday, Will you allow me once more to trespass on your valuable space by saying that provision was made for the Ash Wednesday service, but, owing to unforeseen circumstances at the eleventh hour, over which I had no control, it could not take place. But I returned into residence on Friday following, and was therefore in time for “my Lenten duties” on the first Sunday in Lent, during which season, besides our double daily service, we have had special services with special preachers every Wednesday or Thursday; but I have never seen Mr. Thomas Cooper or his satellites at any one of them. Indeed, while the last of the services was taking place, he was presiding at the very same time over his so-called indignation meeting and trying to set the parishioners against the rector and his wife. But I am glad to find that Mr. Thomas Cooper has not yet forgotten that the day of “the Benediction of Ashes” is the caput jejunii, or first day of the Lenten fast. As to several or any people going to church and being disappointed on that day, this I emphatically deny. Certainly Mr. Cooper would not have been of the number, so he has no cause of complaint. SIR,- On looking at your issue of the 29th inst. I read two letters under the above heading, as to which I should like to say a few words. First as to Mr Bloomfield’s, I will ask him to name a single minister whom he asked to come and officiate here on Ash Wednesday. As to the LOCUM TENENS being called away suddenly, I can only say that he said on the previous Sunday it would be his last service here, and I can personally as to more than one person walking over a mile to find no service. Next as to Mr. Fuller’s letter. I regard it as a gross, personal attack on Mr. Cooper. I am not aware of anyone in the village having complained as to scarcity of services. As to Mr. Cooper’s reference to Ash Wednesday, it was to prove that the Rev. M. Fuller was not accurate when he stated that he returned in time for his Lenten duties. SIR,- The Rev. Morris Fuller concludes his effusion in your issue of the 29th inst. With the following:- ”This one fellow came in to sojourn, and he must needs be a judge.” To gather the full force of the insinuation contained in the quotation the subject which has been under notice must be considered, and the context of the passage read, but which regard for public decency prevents me quoting. It is so far beneath all possible contempt that, great as is the temptation to expose the misstatements contained in the Rev. Fuller’s letters, I shall refrain from further noticing them or any other communication from the same tainted source. ALLEGED EXTRAORDINARY CONDUCT OF A NORFOLK CLERGYMAN’S WIFE. The parishioners of Great Ryburgh, Norfolk, are all up in arms. They say that the whole parish have been shamefully libeled by a clergyman’s wife. In “ Lloyd’s Newspaper” of the 18th ult. Appeared a paragraph headed: “ THE CARE OF PAUPER GIRLS,” setting forth that at a recent meeting of the Shoreditch Board of Guardians a letter was read from Mrs. Fuller of Ryburgh, President of the Ryburgh Boarding-out Committee, proposing to transfer two girls placed in that village, on ground of the immorality prevalent in the place. As our Country Correspondent deals fully with the subject in his “Village Chronicles,” it will suffice for us to give very briefly the case of the villagers. 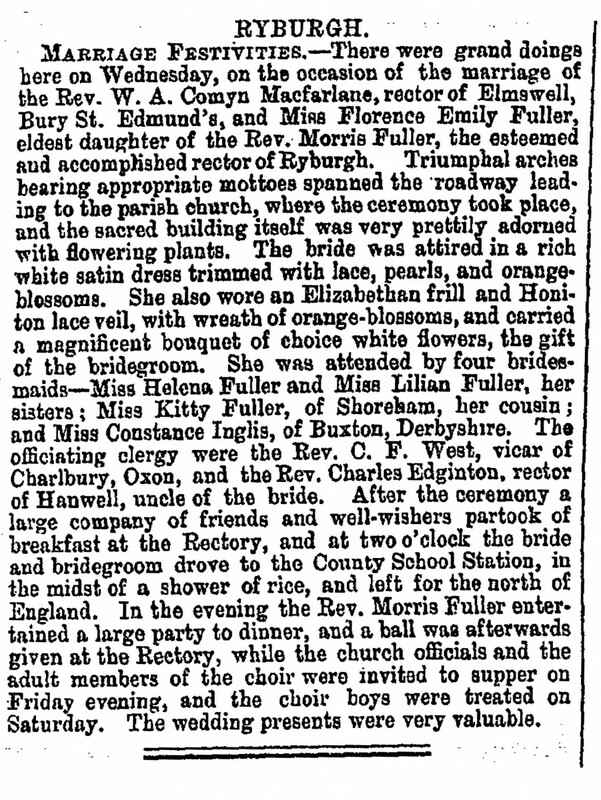 It is said that the daughter of the persons with whom the two orphan children have been living for more than four years, has been married, but not by the rector- Mrs. Fuller’s husband- nor at the parish church, and the wedding was kept a secret for some time. When it reached the ears of the rector and his wife they were very much annoyed, and a correspondent contends that this is the sole ground for the sweeping charge of the prevalence of immorality in Ryburgh which Mrs. Fuller forwarded to the Shoreditch Board of Guardians and thereby secured the removal of the two children from the care of those who had offended her by not taking her into their confidence in reference to their marriage. A rather singular feature of the affair is that there are three other children boarded out in the village, but Mrs. Fuller notwithstanding her serious charge, has not moved for them to be removed from the hotbed of immorality she has led the public to infer that Ryburgh must be. This looks as if although she made a general charge of immorality, she was, in reality, only aiming at one family. The action of Mrs. Fuller appears in a still more extraordinary light seeing that the other members of the Committee are Mrs. Mesney and Miss Lee Warner who have never we believe made such a charge against their fellow parishioners. Another singular fact noticed by our correspondent is that although according to Mrs. Fuller’s statement the village of Ryburgh must be literally teeming with immorality, yet, it is said, that its rector, the Rev Morris Fuller, who draws £600 from the parish in the shape of stipend, has only just returned with his family from a six months’ sojurn at Brighton. Anyhow we feel that the libeled parishioners are fully justified in demanding a thorough ventilation of the grave charges made against them by Mrs. Fuller. THE CASE OF THE PAUPER GIRLS.—At the Shoreditch Board of Guardians, on Wednesday, a letter was read by a clerk from Mrs. Fuller, of Ryburgh, the president of the Ryburgh Boarding-out Committee, proposing to transfer two girls placed in that village by the Shoreditch Board of Guardians to the Servants’ Training Home at Fakenham. She stated that whether the girls were sent to that instition or not, it was imperatively needful that they should be removed from Ryburgh, on account of the immorality prevalent in that village. Mr. Alabaster said it was clear that a mistake had been made in the selection of Ryburgh, and moved that the children be brought away forthwith and placed in the institution belonging to the Board of Guardians at Shoreditch. The motion was agreed to. Now, bor, heer’s the explanayshun. Sent tew me by sumboddy hew fare tew know of this ere werry serious charge agin the inhabitants of a hoal willage made by Mrs. Fuller, hew is supposed tew be the wife of the parsonof the willage hew is drawin’ £600 a year owt of the place. My korryspondent say “Dewrin’ the parst year the darter of the people wi’ hoom the two orphan children referred tew in the paragrarph hev bin livin ‘ fur the parst four years wos married, but not by our rekter, the Rev. Morris Fuller, nor at the parish charch at all. The weddin’ wos not knowed abowt heer fur sum time arterwards. When the rekter an’ his wife fownd owt that they wos really married, they seem tew hev bin werry much annoyed that they warnt made acquainted wi’ it before. Fooks abowt heer seem tew think as how it wos owin’ tew the annoyance felt by parson an’ his wife over the affare that Missus Fuller determined tew try an’ git the children removed in which as yow see by the extract from “ Lloyd’s” paper they wos only tew sucksessful. But whether the men an’ wimmen of Ryburgh will tamely submit tew be libeled hoolsale an’ held up tew the warld at large as immoral fooks, even by a parson’s wife is quite anuther matter. Ef they’ve got enny real owd Norfolk grit in ‘em , bor, they’ll compel the Missus Fuller hew rit tew the Shoreditch Board of Guardians tew make gude har wurds or apologise fur perpetratin’ sich a whopper lie abowt innersent fooks. My korryspondent say he spose as how the Missus Fuller hew rit the blaggard letter defamin’ the inhabitants of the willage of Ryburgh never thowt as how it wood ever bekum knowed heer how the chilren kum tew be removed, but thanks tew the Press everyone know how the little muve wos wurked. When these children wos fust placed in the parish by the Shoreditch Guardians, the present rector wasn’t heer, but the Rev. Tatham hew wos then our parson (bless his dear owd honest heart) highly recommended the people as bein’ proper persons tew hev the charge on ‘em. Mrs. Tatham, Mrs Mesney, and Miss Lee Warner wos appointed a Committee tew attend tew thare welfare, and I ax ennybody hew know these ladies whether they wood fur wun moment wink at immorality ov enny sort or allow poor children tew remain ware thare morals would be talnted? Abowt tree yeers ago Mrs. Tatham left. the narbourhood_and wos suckseeded in har dewty of lukln' arter the chilren by Mrs. Fuller. But, bor, I karnt help thinkin’ as how before the Shoreditch Board ov Guardians took enny noatis ov Mrs.Fuller’s letter they ort tew hev inquired ov the rest ov the Committee as tew whuther the facts wos as Mrs. Fuller had rit, namely that the hoal willage wos immoral. At least they ought tew hev bin adwised by the committee, as at present thare action and that ov Mrs. Fuller luke uncommonly like a refleckshun on Mrs. Mesney and Miss Lee Warner. Ef Mrs. Fuller is rite in wot she say then Mrs. Mesney and Miss Lee Warner ort tew hev found owt the immoral state of the hoal willage long ago and hev took ackshun in the matter tew git the children remoaved. But perhaps the Guardians thowt Mrs. Fuller wos a parson’s wife an therefore coodn’t possibly speak nowt but the strickt trewth. The inhabitants as I sed afore hev a werry strong feekin’ on this question an heer’s a werry funny bit which luke as ef Mrs. Fuller’s letter wos really meant tew aim at one family. We hev tree other children bownd out by the Shoreditch Guardians, but although Mrs. Fuller say the willage is immoral an’ unfit for pauper children, yet the Guardians hev not removed these tree children which are under the werry same skule an’ wood I presoom be liable tew the same corruption what Mrs. Fuller complane on unless the immorality is only in the house whare the tew children lived, but which Mrs. Fuller havn’t dared tew allege. But, bor, heer’s anuther werry strong pint. Ef the willage of Ryburgh is so wery immoral as Mrs. Fuller say it is how is that the Rev. Fuller an’ all his family hev only just concluded a six month stay at Brighton instead of bein’ at hoam among the parishioners dewin their Marsters work fur which they are uncommonly well paid, an tryin’ to conwart the wicked an’ put ‘em on the rood tew heven. Either parson an’ family hev sadly neglected the souls health of their parishioners or the willage carnt hev bin in such a werry bad immoral state as Mrs. Fuller say. Besides ef parson would only spend the munny he hev owt of the willage in the willage instead of spending it at Brighton he wood dew no end of gude tew our tradesfook an’ cause an excellent feelin’ in the parish. Ennyhow, bor, ef the fooks of Ryburgh hev got the pluck of a werry small insect, they’ll never rest till they hev shown the slanderers of the willage up in their trew colours. Bor I've heerd owd fashun'd fooks make use of an owd sayin' as how the more ennybody star, the moar they'll raise a parfume, an' struse me, I beleeve the owd-fashuned fooks wos rIte. .Itwos parson's wife hew rit the werry onbecomln' letter chargin' a hoal parish wi' immorality, cos she'd got har knIfe Into wun family. Bor, a more disgraceful thing I never heerd on. Wood parson's hevenly Marster hev tritted the meanest among the multitude so? Sartinly not, even sposin' enny on 'em wos guilty. He wood hev sed go an' sin no moar, an' wood hev set 'em a glorious example of how not tew sin. Our parson an' his wife act jest contrary tew this, an' hevin' got intew a scrape, insted of confessin' thare error, they go, an figgeratively speekin' scrape up moar mud tew heeve at the werry pussons they hev jnjured. This arnt the way tew make the charcb respected amung the wurkin' -classes, is it? When Marster Cooper. the overseer, seed" Lloyd's Newspaper" containin' pious Mrs. Fuller's werry pious letters, he sent her a letter axin' whether she disputed the accuracy of the report, an' ef so what steps she intended tew take. Wood you believe It, bor, this heer preshus wife' of a successor ov the Apostles, drorin' £600 .a year owt ov the parish, an' spendin ' munths at. Brlghton, the London by the Sea, hant got the common perliteness ov a wosherwoman,. an' werry insultingly retarned Mr. Cooper's own letter tew him, sayin' she had nowt tew add. ThIs showed har broughtens up dint it? But the fun wos when she rIt a letter tew Marster Bradley, in which she.admItted as how ef she'd known har letter wood hev been made public she woont hev rit it. But wot bisness had she tew rIte It at orl, hay, bor? Accordin' tew har own showin' she went an' made a charge.of immorality agin a hoal parish on no evidence, She say, "We are a parish of 9OO people. How very few honour the Sabbath, or attend any place of worship on the Lord’s day? Is that morality?” But, bor, I suppose bein’ a parson’s wife, she go to charch on Sunday, but what benefit is there in that, ef it doant keep har tongue from slanderin’ people. In har letter tew the skulemarster Mrs. Fuller try tew trim har sails an’ tew tarn orf har charges ov immorality tew other things orltewgether from what every wun know she really meant. In ther fust place she tarn it on tew so few fooks attendin’ charch, blarm it , bor, ef parson an’ his wife doant interest thareselves in the parish is it likely the parish’ll interest thareselves in goin’ to charch? Parson and his wife, I’m towd, scarcely ever visit the poor. Secondly, Mrs Fuller bring up poachin’ an’ other misdemeanors as immorality an’ call on the game preservin’ justice Shallows of the Fakenham Bench tew back har up. Jest as ef ennyboddy wi’ commonsense pay any attenshun tew the remarks ov game preservin’ justice on poachin’! On referrin’, however, tew a file ov a local paper I find as how there hev bin oanly eight cases ov any description from this ere parish dewrin the parst twelve months so Mrs. Fuller is floored agin, hay, bor? Thirdly, Mrs. Fuller tarns tew a few solotary cases ov over-crowdin’ in cottages, but, bor, the fooks as is over-crowded is more to be pitied than blamed. Why doant parson an‘ other big guns instead of spendin’ thare munny at Brighton, spend it in buildin’ proper cottages fur the poor an’ thus prewent over-crowdin’, hay, bor? Fourthly, Missus Fuller point tew breaches ov the Seventh Commandment in the willage. Will she kindly point out enny willage withowt sin in that respect? Why I know a willage where a titled lady an’ a parson’s wife hev got names like mad dawgs fur thare flighty conduct wi’ sowjers. But, bor, the cheekiest part ov Missus Fuller’s letter is ware she, arter slanderin’ a hoal willage withowt cause, say:-“ I have been advised that Mr. Cooper’s conduct in placarding my name all over the village with such damaging remarks is actionable; but as I cannot conceive that any gentleman could so insult a lady, and I do not care to do battle with anyone but a gentleman, and as I wish to prove to my porishioners that I love peace and unity and their welfare more than personal redress, I shall pardon my slanderer, and trust that whatever other resolusion may be passed to-night, this at least may be one- That we all strive to live more in the spirit of our Lord’s Sermon on the mount: and so prove to the world that we are not only a moral but a God-fearing people.” This is , indeed hevingly! Excuse fudder remarks, bor, my feelin’s overkum me. But howd hard, just wun parting wurd. I shood strongly adwise the fetch-an’-carry poodle , tew be werry cautious fur the fewcher, as she is “ spotted,” and fooks hev made up thare minds that they will not submit tew be so shamefully slandered agin. Hew hev hears tew heer let har hear. Parson Fuller’s letters in the press, bor, hev causeda lot ov comment. Marster Cooper hant no intenshun of complainin’as tew the sarvisses at the charch not bein’ moar frequent, when he korled attenshun tew the fackt that there was no sarvis heer on Ash Wednesday. I think he oanly wished tew point owt as how parson’s statement that he returned in time for Lenten duties, an that he expected his “loakum teemens” wood hev stayed over Ash Wednesday wos sumwot lacking in precishun. You see, bor, unfortunately fur Parson’s theory the Rev. Smith towd the congregayshun at the charch in the arternune ov Sunday, February 12th that that wood be his larst sarvis heer. Parson say that every howse in the parish hev bin carefully wisited weekly. A korryspondent says as how that dewrin’ the years he hev binheer he haint wisited his howse more’n harf a dussen times, and nuther hev the district visitors. Fudder, parson in his letter tew Marster Cooper, dated 21st. March, he began by sayin’, “ I wos werry much pained on goin’ tew charch larst evenin’ tew find posted up on the doors of the charch a public indictment as tew the veracity of the rector’s wife,“ meanin’ the noatis poasted by Mr. Cooper stating that he should call attenshun tew Mrs. Fuller’s letter arter the parish bisness wos over on the 23rd. ult. Fooks fare tew think that parson must hev bin mistook in sayin’ he seed the noatis on the charch doors, as it wos pulled down by sumwun afore four o’clock, and he dint go tew charch till the six o’clock sarvis. The Guardians ov Shoreditch, as I sed afore, sent thare Clark, Marster Clay, down, but he dint hewd a public inquiry at orl, orlthow Marster Cooper had proposed tew pay £5 ov the expense ov sich an inquiry. He wos made werry welcome, I’m towd, at the Rectory. Ennyhow, the willage feel that he coodn’t hev fownd immorality so werry prevalent in the willage, as the children hev not yet bin removed, an’ wun is tew stay orltewgether, an’ anuther wun is tew stay ef a sittywayshun cood be fownd fur har. Larst Sunday parson tuk the fooks tew dew fur not givin’ moar freely at the offertory, an’ a korryspondent say on lukin’ on the Charch door, he find as how there’s an expenditure ov £40 above the inkum. On examining the account cloaser, he say he fownd there wos an item of £11 16s. 81/2d fur candles, ov which sum £10 10s. 6d. wos spent at Fakenham, leaving oanly 17s. 21/2d. tew be spent in our own willage, wich hev disgusted fooks werry much indeed. They say as how parson coont hev examined this account werry cloasly, or he woont hev had the face tew hev tarned rownd an’ find fault wi’ the people fur not givin moar largely tew the offertory. Fooks think he ort tew go tew the Fakenham tradesmen fur the balance, seein’ as how that is whare moast f the munny wos spent. Anuther point made by my korryspondent is that the candles are barnt jest tew please parson as the charch is lited with paraffin lamps an ‘ anuther thing is there wos no sarvis at nite fur over tew months this winter. Fooks fare tew think that ef parson must hev candles barnt tew please his High Charch principels he ought tew pay fur them hisself. There is orlso anuther item of £1 1s. fuur flowers fur charch decorations, now ef parson wos a little moar friendly wi’ his parishioners he wood never hev enny need tew buy flowers fur that purpose as he wood find plenty ov willin’ hands tew decorate the charch. Anuther error in won ov parson’s letters tew the “E.D.Press” is when he stated that he took his annnewal holiday ov two months in the winter in preference tew the summer, an’ he wos oanly away tew months. My korryspondent say as how parson fare tew hev forgot tew add that he had ten weeks holiday previous tew that an’ had let the rectory as a shutin’ box tew a gent named Harvey an oanly hed a clergyman kum down on the Satterday nite an’ goin’ away agin on the Munday mornin’. This heer deputy parson used tew lodge at Stibbard, an adjoinin’ willage. This doant fare like takin’ werry grate care ov the flock confided tew his charge, hay, bor? But howd hard, I forgot, he werry kindly left his cook tew luke arter us an’ forrard he buulyteens I spose ov the spiritooral an’ temporal helth of his sheep. must hev knowed that that is rong, cos fur years parst thare hev niver been more’n a dussen persons at a parish meetin’. There wos a westry meetin’ heer tother mornin’ tew appoint Churchwardens, &c., an it wos rumoured that the parson intended tew try an’ git a new parish churchwarden appointed in the place of Marster Habert Smith, hew seconded the reserlewshun at the meetin’ on 23rd. of March. Thare wos ten pussons present, an I wenshur tew say that had ennywun suggested that Marster Habert Smith shood be suckseeded by his bruther or ennywun else, they wood have bin at wuns defeeted; but I spose they thowt discreshun the best thing, an’werry wisely let matters rest as usual. Hant sich a rumour got abroad, bor, thare woont hev been mor’n four pussons present. So much fur “A Parishioner.” Letter. I’m towd as how the “Bobby” wos engaged by sumboddy tew act as bobby-guard tew sumboddy hewse konshens towd he deserved summat. I wunder hew it wos, hay, bor. I forgot,bor, tew say as how wun ov the standin’goaks in our immoral parish jest now is Charchwarden Paradox’s whitewash. At the same time, bor, the tone ov parson’s letter and his makin’ use ov a text from the Gude Owd Book tew insult Marster Cooper wi’, hev caused no end ov disgust. Can ever put Humpty Dumpty tewgether agin. When parson go intew his secret closet tew pray, I’m sure he’ll feel wexed fur the spiteful letter wot appear over his name in the “E.D.Press” ov the 29th March. I carnt bring myself tew bleeve, bor tha a Successor ov the Apostles of Him hew admonished His followers tew luv their enemies and pray fur them hew despitefully use them, ever penned such an epistle consarnin wun ov the sheep of his flock for which he draw £600 a year owt ov the parish tew feed wi’ spirityal food. I hev been wotchin’ the papers day arter day expectin’ tew see a disclaimer from parson. An’ left tew har sighs an’ har teers. To the dark shade ov shame an’ disgrace. This ere willage seem tew be reglar under a bad planet. The tother week it wos slandered hoalsale an’ now sumboddy rit tew say as how a short time ago a blarmed County Court bum wos seen hangin’ rownd a sartin howse wi a large bundle ov official lukin’ papers in his breast pocket, which a little berd hew luked over his showder artewards whissled wos County Court summonses, Alars poor willage this is even wuss’n tother thing. The CLERK (Mr Alabaster) asked for a cheque for £17 10s. for the Ryburgh Boarding-out Committee, and reported that he went down to Ryurgh as requested by the Board. His mission of course was not to inquire into the morals of Ryburgh, but as to what was best to be done for the children. He saw the Rector and his wife and Mr Cooper, and the schoolmaster, and there seemed a general agreement it would be better for the children to leave there under the circumstances. In his own opinion there were special reasons for bringing away four of the children, and the nature of the locality itself was not adapted for a successful carrying out of the Boarding-out principle, but in the fifth case the child was residing with a widow and her bachelor son, a labourer about 40 years of age, and a strong attachment had grown around the child. he thought in that case the child should be kept there until she was 14. Had he known the place before the Guardians had agreed to send the children there he should have advised them not to let them go. Mr. COX moved that a cheque be drawn, and that some report on the lines indicated by the Clerk should be made to those responsible for the boarding -out system. The CLERK intimated that so long as the children had been there they had been thoroughly well cared for. The motion was after some conversation carried. Copyright Transcribed by Peter Trent September 2010.